Not to be confused with Antonio Puertas. This name uses Spanish naming customs: the first or paternal family name is Puerta and the second or maternal family name is Pérez. Antonio José Puerta Pérez (Spanish pronunciation: [anˈtonjo ˈpweɾta]; 26 November 1984 – 28 August 2007) was a Spanish footballer who played solely for Sevilla. Mainly a left midfielder who could also operate as an attacking left back, he died on 28 August 2007 affected with arrhythmogenic right ventricular dysplasia, three days after suffering a series of cardiac arrests during a La Liga game against Getafe on the 25th. Puerta won five titles with his only club. Born in Seville, Andalusia, Puerta joined Sevilla FC as a boy and spent a total of 14 years at the club, growing up at the club's acclaimed youth system alongside other players such as Alejandro Alfaro, Kepa Blanco, Jesús Navas, Sergio Ramos and José Antonio Reyes. His La Liga debut came on 21 March 2004, as he played 71 minutes in a 0–1 home defeat against neighbours Málaga CF. Definitely promoted to the first squad for the 2005–06 season, Puerta became intimately connected to Sevilla's history on 27 April 2006, when he scored against FC Schalke 04 in the semifinals of the UEFA Cup: in the final moments of the match, he received a long ball and struck it with his left foot for the 1–0 final (and aggregate) win – Sevilla went on to collect five titles in fifteen months, with Puerta scoring his penalty shootout attempt in the 2007 UEFA Cup final, against compatriots RCD Espanyol; his impressive performances earned him international recognition and reported interest from Arsenal, Manchester United and Real Madrid, but all bids were rejected. On 25 August 2007, Puerta collapsed and lost consciousness in the penalty area due to a cardiac arrest during Sevilla's first La Liga match of the 2007–08 campaign at homeground Sánchez Pizjuán against Getafe CF. He was seen crouching and then subsequently collapsing upon moving back to his team's goal after only 35 minutes of the game had passed, as teammates Ivica Dragutinović and Andrés Palop immediately ran to his side as he lost consciousness; moments later, club medical staff and other players followed suit. After recovering and being substituted, Puerta was able to walk to the dressing room, where he collapsed once again. He was resuscitated by the doctors and taken, by ambulance, to the intensive care unit of Virgen del Rocío hospital, where he received cardiopulmonary resuscitation. Puerta died on 28 August 2007, at 14:30. Doctor Francisco Murillo reported that he had suffered multiple organ failure and irreversible brain damage as a result of multiple prolonged cardiac arrests due to an incurable, hereditary heart disease known as arrhythmogenic right ventricular dysplasia. There was no official word on whether he had ever been equipped with an implantable cardioverter-defibrillator, an essential precaution in people with the disease; his premature death was similar to those of Marc-Vivien Foé, Matt Gadsby, Miklós Fehér, Renato Curi, Serginho and Phil O'Donnell, all of whom collapsed whilst playing football. Puerta's girlfriend was expecting their first child at the time of his death. As a mark of respect, players from both Sevilla and city rivals Real Betis attended his funeral days after his death and, subsequently, FIFA ordered the installation of resuscitation rooms in every stadium that hosted the World Cup qualifiers. As a result of Puerta's death, Sevilla's UEFA Champions League qualifier against AEK Athens F.C. was postponed until the fourth of September– Sevilla eventually won 4–1. The club also announced that a one-minute silence would be held before every league match on the weekend of 1–2 September 2007. Additionally, Sevilla's UEFA Super Cup game with A.C. Milan on 31 August went ahead, as a tribute to the player, with all 22 participants having the name 'PUERTA' printed on the back of their jersey. The players and officials on both sides also wore black armbands. Sevilla subsequently retired Puerta's number 16 shirt, with the provision that should his son, Aitor Antonio (born 22 October 2007), one day play for the club, he will have the option to bring the number out of retirement. However, Spanish football teams were not allowed to do so, as the Royal Spanish Football Federation stated that clubs should use number 1 to 25 for their regular squad, with no additional room for manoeuvre; as a result, David Prieto wore the shirt in 2007–08 in honour of his friend but it was later decided that only youth products could wear that jersey. Controversially, the number was given to Argentine Federico Fazio in 2016. One year later, it was awarded to Jesús Navas, a close friend of Puerta, upon his return to the club in 2017. Ramos wore t-shirts in memory of Puerta after Spain won UEFA Euro 2008 and the 2010 FIFA World Cup, with Navas doing the same on the latter occasion. Earlier in 2010, a statue of him was built in the club's José Ramón Cisneros Palacios sporting facilities; moreover, Ramos had a tattoo of Star of David on his arm in memory of Puerta since the latter was Jewish. Puerta was capped once by the Spain national side, playing against Sweden on 7 October 2006: he came on as a substitute for Deportivo de La Coruña's Joan Capdevila in the 52nd minute of a 0–2 away loss for the UEFA Euro 2008 qualifiers. Additionally, Puerta appeared five times for the under-21s. ^ "Antonio Puerta, una vida de sevillista" [Antonio Puerta, a lifetime as a sevillista]. El Mundo (in Spanish). 28 August 2007. Retrieved 18 December 2014. ^ a b c "Sevilla midfielder Puerta dies". The Guardian. 28 August 2007. Retrieved 28 August 2007. ^ "0–1: Era un momento clave, tocaba pifia" [0–1: It was a key moment, screwup was expected]. ABC (in Spanish). 22 March 2004. Retrieved 4 May 2017. ^ Graeme Bailey; Mark Kendall (13 December 2006). "United join Puerta race". Sky Sports. Archived from the original on 29 September 2007. Retrieved 28 August 2007. ^ "Sevilla's Puerta dies in hospital". BBC Sport. 28 August 2007. Retrieved 28 August 2007. ^ "Dragutinovic: "El único mal recuerdo es la pérdida de Puerta"" [Dragutinovic: "The only bad memory is the loss of Puerta"]. El Correo (in Spanish). 25 May 2011. Retrieved 4 May 2017. ^ "Fallece el sevillista Antonio Puerta tras más de dos días en la UCI" [Sevilla's Antonio Puerta dies, after more than two days in ICU]. El Mundo (in Spanish). 28 August 2007. Retrieved 28 August 2007. ^ "Sevilla's Puerta dies three days after collapse". ESPN Soccernet. 28 August 2007. Retrieved 28 August 2007. ^ "Fallece el futbolista del Sevilla Antonio Puerta" [Sevilla footballer Antonio Puerta dies]. El País (in Spanish). 28 August 2007. Retrieved 28 August 2007. ^ "Girlfriend of Sevilla's deceased midfielder Antonio Puerta gives birth to his son". The New York Times International Edition. 23 October 2007. Retrieved 23 October 2007. ^ "Del Nido anuncia que el Sevilla retirará el dorsal '16'" [Del Nido announces Sevilla will retire No. 16 jersey]. Marca (in Spanish). 1 September 2007. Retrieved 13 September 2007. ^ "David Prieto llevará el "16" de Puerta" [David Prieto will wear Puerta's "16"]. Diario AS (in Spanish). 22 July 2008. Retrieved 18 December 2014. ^ "Luismi lucirá el '16' de Puerta" [Luismi will don Puerta's '16']. Marca (in Spanish). 30 July 2015. Retrieved 11 August 2015. ^ "El sevillismo, indignado con Fazio por elegir el dorsal 16 de Puerta" [Sevilla faithful, outraged by Fazio for having chosen Puerta's number 16]. Mundo Deportivo (in Spanish). 8 February 2016. Retrieved 12 April 2016. ^ "Navas llevará el dorsal '16' de Puerta" [Navas will wear Puerta's '16' jersey]. Mundo Deportivo (in Spanish). 3 August 2017. Retrieved 9 September 2017. ^ "Ramos y Navas rinden homenaje a Puerta" [Ramos and Navas pay homage to Puerta]. ABC (in Spanish). 1 July 2012. Retrieved 18 December 2014. ^ "Un monumento para Antonio Puerta" [A monument for Antonio Puerta]. El Correo de Andalucía (in Spanish). 27 April 2010. Retrieved 18 December 2014. ^ "Antonio Puerta, eterno 16" [Antonio Puerta, eternal 16]. Mundo Deportivo (in Spanish). 28 August 2013. Retrieved 18 December 2014. ^ "MAKES YOU INK: Heart-breaking tattoos – when footballers like Zlatan Ibrahimovic and Sergio Ramos pay tribute in ink". The Sun. 4 December 2017. Retrieved 27 May 2018. ^ "Sweden too strong for sorry Spain". UEFA. 8 October 2006. Retrieved 31 March 2014. ^ "Mediterranean Games 2005 (Spain)". RSSSF. Retrieved 27 September 2016. 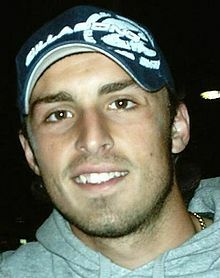 Wikimedia Commons has media related to Antonio Puerta.